The sample Personal Reference Check Forms/Letters, Driving Record Check, Employment Reference Release & Reference Control form are available free to download, customize and print for your small business or company’s HR Department. Use the Reference Check Form or Letter (Personal) to verify who your candidate for hire really is on a personal basis. You can also find out if there are any reasons that would prevent the candidate from performing the functions of the position. Prior to making a job offer, a prospective employer will always need to check references. Many employers will only be willing to give out starting and ending dates of employment and salary information. Other employers may be willing to discuss their job performance, work ethic, attendance at work, attitude, and other criteria that is important to your company when making a decision on whom to offer the job to. There is no doubt that reference checks are a very important part of the hiring and interviewing process in your small business. The reference check letter is time consuming, but is very necessary. As a business owner, always make it a standard procedure for candidates to sign a form authorizing you to check their employment history and personal references. If for some reason they refuse to sign this form then chances are they are not a viable candidate for your company. The Driving Record Check (sample letter) below to the state is available if you’re hiring someone to operate a motor vehicle for your small business. Always make sure you know what kind of driver the prospective new employee is before proceeding because states maintain detailed records of the driving infractions committed by each driver but the extent of these records vary from state to state. This information can also be of interest when hiring someone to operate a forklift or other heavy, mobile equipment. 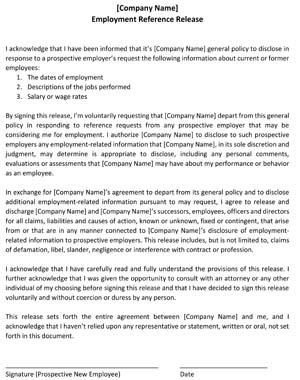 The Employment Reference Release below has to be signed and dated before any type of reference check is done on a prospective new employee. Check with your company lawyer on the rules and regulations of your particular state but the the release below is a great tool to use to create one of your own.